Apostolic preaching was intentionally persuasive. Rhetoric is the art of persuasion. Therefore, apostolic preaching was rhetorical without being dependent on rhetoric. Unfortunately, the church in the first few centuries moved away from the apostolic model of limited rhetoric to a culturally popular model of professional rhetoric. As society accepted the church, preachers adopted a professional model for preaching, and the sermon took on the rhetorical style of the culture. Modern sermons, too, can bear little resemblance to the apostolic model in our desire to be culturally relevant. Why? What changed? The atheist philosopher Friedrich Nietzsche wrote, “he who knows himself to be profound endeavors to be clear; he who would like to appear profound endeavors to be obscure.” Too many homileticians labor to sound profound as they seek to make their books academic. Thankfully, not David Helm. 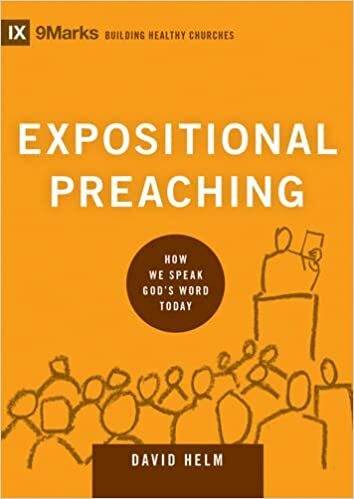 His book, Expositional Preaching: How We Speak God’s Word Today, is short, lucid and insightful. I have read many books on preaching in recent years and, I must confess, when I picked this one up I wondered if anything worthwhile could come from such a short text. I was wrong. These 112 pages are as helpful a text on preaching as I have read in some time. David Helm is the lead pastor for Holy Trinity Church in Chicago, Illinois and the chairman of the Charles Simeon Trust, a ministry devoted to expositional preaching. He wrote the book to be the preaching entry in the series, 9Marks: Building Healthy Churches led by Mark Dever. The first mark of a healthy church is expositional preaching, and this book explains what that means in a very readable manner. You can check out more resources on their websites, www.simeontrust.org and www.9Marks.org. I recommend both ministries as excellent resources for any pastor. Should the main idea of the sermon follow the main idea of the biblical passage in expository preaching? The question strikes at the heart of what we do. Text-driven preaching answers “yes” to the question. The text should drive the sermon otherwise we are in danger of using the text to support our ideas instead of submitting our ideas to the authority of the text. I agree. However, some preachers do not agree. One preacher recently posted an article on www.preachingtoday.com entitled “The Main Point of a Passage Should not Always be the Main Point of Your Sermon.” He used 1 Corinthians 6:12-20 as his example. The main point of the passage, he wrote, was “don’t visit the prostitutes,” and that would not apply to the listeners in his congregation very well. He decided that he should not preach the main point of the passage as the main point of his sermon. Easter Sunday was great. Monday morning, not so much! The “Monday morning blues,” sometimes labeled the “happiness hangover,” mean something different for pastors than for others. The “Sunday night blues” turn into the “Monday morning blues” for many people because they are starting their work week. A 2015 poll conducted by Monster.com found that 76% of employees called their Sunday night emotions “really bad” (Monster. com 6/2/15). Pastors suffer from a happiness hangover not because they are starting the work week, but because they ended the work week. The emotional high of Sunday gives way to the riptide of the blues on Monday morning. Today’s preacher faces the twin challenges of biblical illiteracy and chronic distractability. A 2014 study showed that 40% of Christians who attend church read their Bibles once a month or less (Jared Alcantara, “Preaching Sermons: 2027 Edition, Five Challenges and Five Opportunities Facing Pastors in the Next 10 Years,” www.preachingtoday.com/state-of-preaching). Our churches are increasingly biblically illiterate, and our attentions are constantly distracted. The average American receives 54,000 words and 443 minutes of video every day on social media. Furthermore, there is a new “outrage” demanding our attention every month. The result is that churchgoers have the spiritual attention span of a minnow darting in the shallows (Matt Woodley, “Deep Preaching in a Distracted Age,” www.preachingtoday.com/state-of-preaching).